Now, a SME can be an author in DITA without knowing DITA. This solution is ideal for customers with confidentiality concerns. Information Architects can configure three different user permissions for content: invisible, read-only, or read-write. The UX was revamped to provide a straightforward and easy-to-use layout for lite users, with a user interface that is both accessible and responsive. IXIASOFT CCMS 5.0 provides a democratic, collaborative work environment. In other words: it breaks down the barriers between different teams. In addition, version 5.0 aims to integrate a new, much simpler upgrade experience for customers. The IXIASOFT CCMS Desktop requires good communication with the server components. The latency needs to be better than 50 ms.
To upgrade Desktop components from CMS solution version 4.5 to 5.0: please follow the instructions provided in the Upgrading the IXIASOFT CCMS Desktop from 4.5 to 5.0 Guide. To update version 5.0 Desktop components to the current build: please follow the instructions provided in Updating an Existing IXIASOFT CCMS Desktop v5.0 Deployment Guide (Update Guide). The IXIASOFT CCMS Web component requires a license. Please contact IXIASOFT Sales to find out how your organization can obtain a license or update its existing license to use the new IXIASOFT license model for IXIASOFT CCMS Web. Install a new IXIASOFT CCMS Web component: Once you have your license, please follow the instructions provided in the IXIASOFT CCMS Web Installation Guide. Update an existing 5.0 IXIASOFTF CCMS Web component: Please follow the instructions provided in the Updating an Existing IXIASOFT CCMS Web Deployment Guide. ⚠ Additional requirement for Collaborative Review: configuration files in the Content Store and IXIASOFT Output Generator must be at least at version Desktop 4.5 (minimum). Subject scheme map is not supported in CCMS Web. [DEV-6982] In previous versions of TEXTML 4.4.1.x, some indexes became corrupted. This issue has been fixed. [DEV-7071] Collaborative Review annotations did not appear when reverse proxy was set up. This issue has been fixed. [DEV-5999] Entering the URL for the CCMS Web without the ending forward slash cause a blank page to be displayed. This issue is fixed and now the ending slash is optional. [DEV-6265] When trying to move a topic to a previous workflow state, the web client became unresponsive. The Tomcat logs showed an “unknown cycle specified in status string: Authoring:open” error. This issue has been fixed. [DEV-4299] IXIASOFT CCMS Web was unresponsive when the <reference/>, <prefix/>, <middle/> elements were missing from the users defined in the users.xml configuration file. This issue has been fixed. [DEV-5449] When running the upgrade script, the oXygen workspace plugins were not updated. This issue has been fixed. [DEV-4651] If the IXIASOFT CCMS Web was open in one browser and another session was opened in a separate browser, an error message appeared stating: “An internal error has occurred (HTTP error 500). Please contact your system administrator.” This issue has been fixed. [DEV-4761] IXIASOFT CCMS Desktop experienced performance issues when working with subject scheme maps in DITA Map view. These issues have been fixed. [DEV-5341] Instead of using relative paths, the DTD parser now uses public IDs specified in the ENTITY declarations to resolve the references between the modules. [DEV-5533] When cloning a keydef in DITA Map view and selecting the option “Replace original component“, the key value was incorrectly changed to match the new topic ID. This issue has been fixed and the keydef retains the original key value. The advanced user guide for IXIASOFT CCMS version 5.0 is packed with information to help users author, manage, publish, and track their documentation. 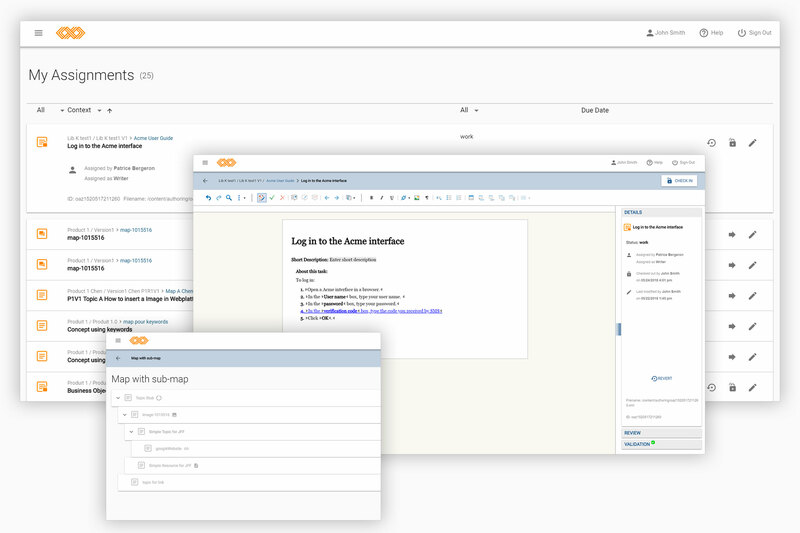 Version 5.0 offers tremendous control and flexibility, allowing users to work modularly, re-use content in multiple deliverables, manage the localization process, and much more. Read on to get started. The Dynamic Release Management module supports organizations managing many products. This guide provides a detailed overview on the DRM module (including terminology), and directions on setting up the documentation structure. Additionally, the guide covers topics like comparing and synchronizing documents, version tags, and setting your environment to use the DRM. This user guide covers the basics from A to Z. Not only will it teach you how to use IXIASOFT CCMS Web, it will help you understand the intricacies of how it works. Learn how to create and edit a map or topic, work on an assignment, or perform a collaborative review. This step-by-step guide makes it easy to get acquainted with version 5.0. The Administration Guide acts as a how-to for customizing IXIASOFT CCMS. Designed for administrators who configure and manage IXIASOFT CCMS, this guide covers it all, including topics like managing roles, users, and access rights, configuring localization, and troubleshooting.